Have you ever had a set that you just HAD to HAVE as SOON as it was available and then well…it sits, and it sits, and it sits? I’m SURE that doesn’t happen to you! LOL!!! I just HAD to have this leaf set when it came out (and matching framelits of course)…that would be back the beginning of June. And yep…this was the first time I used it. Meanwhile I absolutely HATED Lighthearted Leaves in the Holiday Mini, bought it on a WHIM and used the heck out of it. Go figure! LOL!!! But anyway…back to THIS card. It’s Tuesday and it’s time for another SUO challenge. This time our theme is Pocket Cards. There are SOOOO many different ways to do pocket cards and you are going to get a nice variety from the SUO Challenge Design Team! I decided to go pretty traditional with mine. I’m sort of stuck on these colors (Pear Pizzazz, Mossy Meadow, So Saffron, Delightful Dijon) for a pretty ‘start of fall’ card! Pretty cool huh? I like how I designed it for the leaves to hang out over the outside of the pocket! Pear Pizzazz – 4 1/4 x 9 1/2, score at 5 1/2 and run the ‘short side’ through woodgrain embossing folder and fold. Round the top two corners of the longer side. NOTE: I did not use adhesive on the side so my inside card could be bigger. Mossy Meadow Dotted dsp (English Garden dsp) – 1 1/4 x 9. Wrap it around the pocket securing in the back. Add piece of Gold Glitter Ribbon (4 1/4″). Your pocket is done! Pear Pizzazz – 4 x 5 1/4, round the top two corners. Whisper White – 3 3/4 x 5, round the top two corners, stamp greeting using Early Espresso, layer onto Pear Pizzazz and put in pocket. Stamp leaves in Early Expresso – small and one long one Delightful Dijon, long one So Saffron, Oak Mossy Meadow, cut out using framelits, layer together and tie Gold Cording Trim around stems. Add to card insert using dimensional to make it easy to ‘hang out’ over the pocket. Add a couple Early Espresso Candy Dots to finish off. 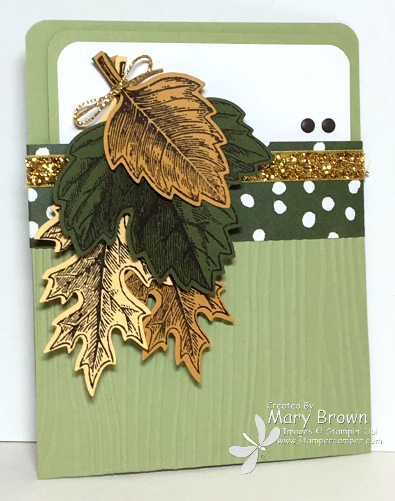 This entry was posted in Holiday Mini, SUO Challenge and tagged Lighthearted Leaves, Vintage Leaves. Bookmark the permalink. Yes, I love how the leaves hang over the card! Beautiful! I have been using this set a lot. Can’t get enough of those leaves. A wonderful design – elegant and perfectly balanced! Thank you for sharing your expertise!! !